Welcome to Promo2day where we feature giveaways, contests, software sales, along with a fun and friendly forum! Do you imagine how many files you are downloading or saving to your computer? Many types are available with different types and sizes, for example books, videos, apps and many more. The built in windows download function is very slow, crippled and doesn’t support resume of your download if interrupted for any reason; (For example; network problems, lost connections, computer shutdowns and so on). You need to start download again. You can spend many hours to download a single file and you will need more effort to arrange your files into folders according to its type. It uses a unique technology to accelerate your downloads through a smart download logic accelerator with intelligent dynamic file segmentation and safe multipart downloading. 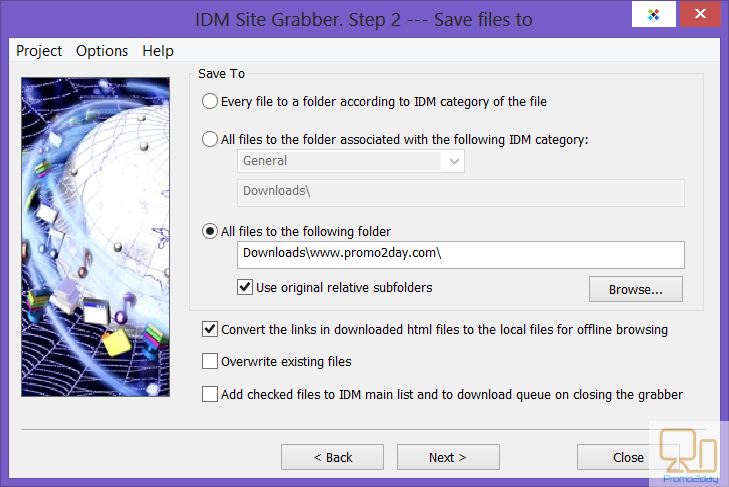 Compared to the other download accelerator apps, IDM segments files dynamically during download process. 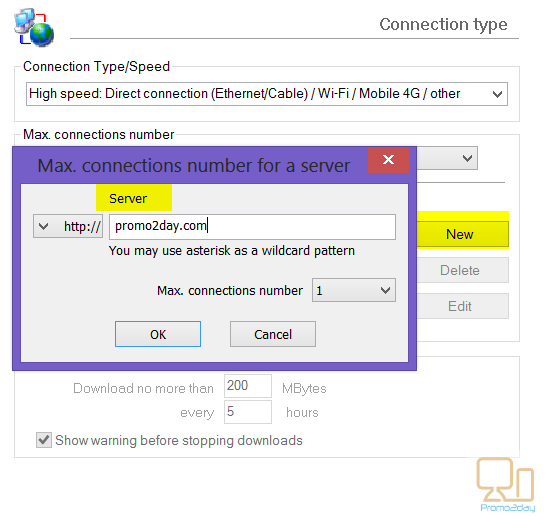 In addition, it reuses available connections without additional connect and login stages. 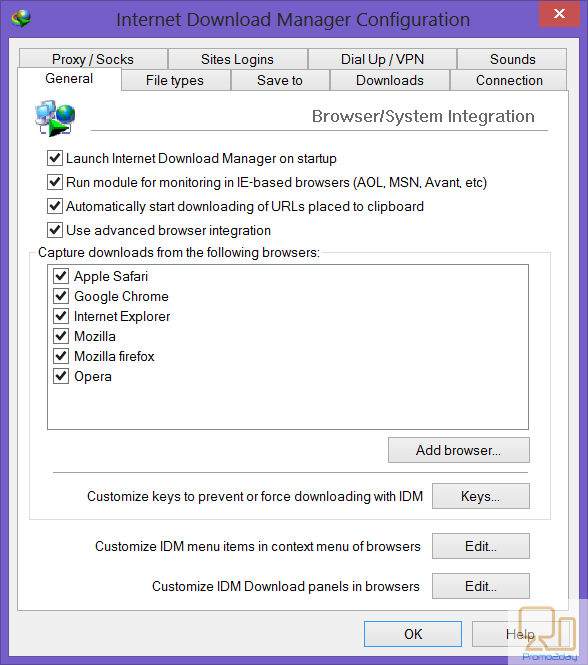 The program uses plugins that support all browsers. 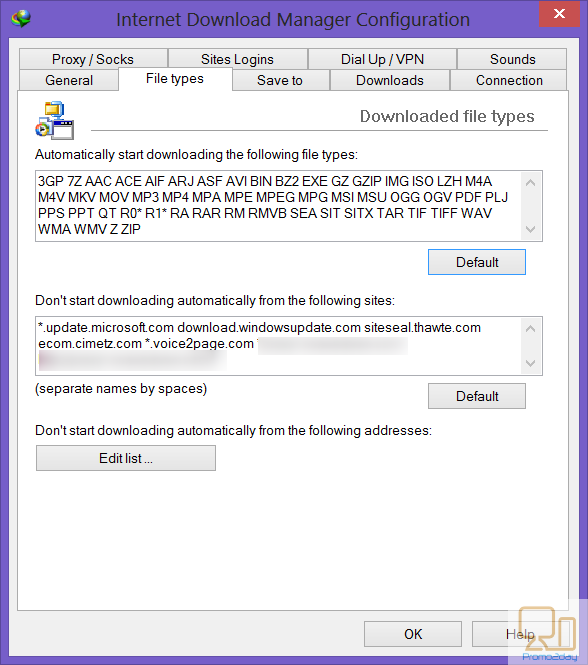 You can use it with any type of proxy and host files. The program needs minimum requirements. It can be installed on all windows versions (Windows XP to Windows 10). Both 32 and 64 bit systems are supported. Only 12 MB of free disk space and 512 Mb RAM is required. There is a retail version that is available only after purchase. The link to the retail will be emailed to you with the license key. Insatallation of the program is very easy and can be done in few seconds with a few mouse clicks. No skills needed for installation. 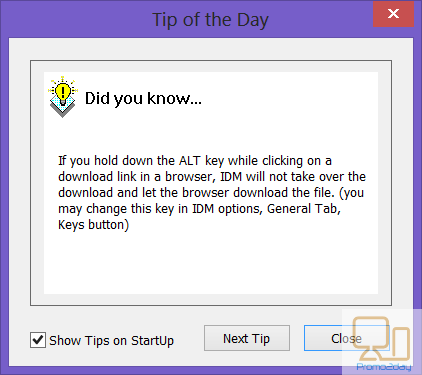 Simply double click on the installer file and follow simple on-screen instructions. The user interface is very friendly, well arranged and easy to use. We will explain in details the user interface and the menu drop down to help you start using the program with no problems. In the upper part of the application, you will see a menu bar with 6 tabs (task, file, download, view, help and registration). Below the menu bar, you will find the download toolbar which includes all the features you need to use and manage your downloads. The default features available include; Add URL, Resume, Stop, Stop All, Delete, Delete All Completed files from the list, Options, Scheduler, Start Queue, Stop Queue, site grabber and Tell a Friend. They can be in active or disabled state depending on what actions are possible for the current selection of downloads. You can easily customize this bar according to your needs. The main interface shows the downloads arranged in a list shape with head buttons on the upper part of the download list. These will help you rearrange your files by name, date, size, status and so on. 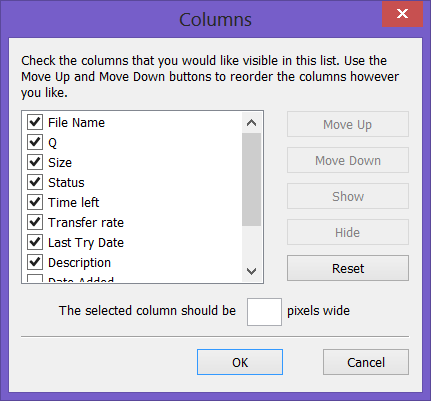 Simply click on the on the column header and you will see that your files are sorted in the way you want. 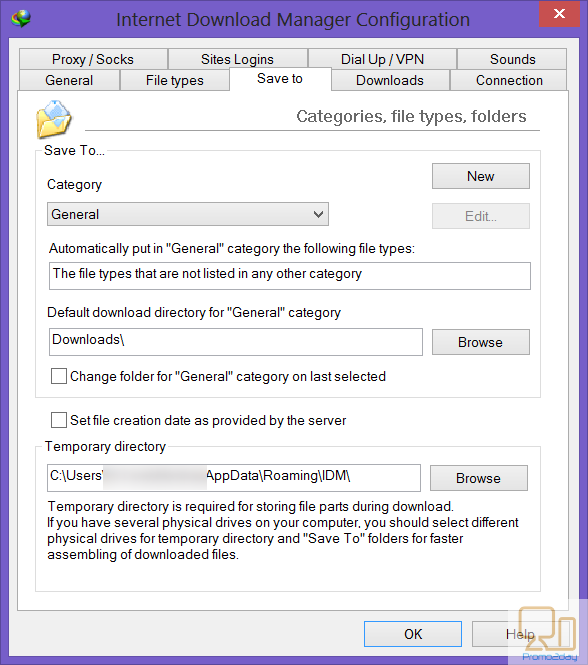 The left side of the main window shows the categories tree which helps to arrange all downloaded files in categories according to its type. There is also finished and unfinished downlods, queues and grabber projects. The downloaded files will be automatically categorized with an option to add more categories if you wish. Simply use right click menu of the categories to add a new category and rename it. You can hide the categories pane if you wish using the option present in view menu. How to customize user interface? 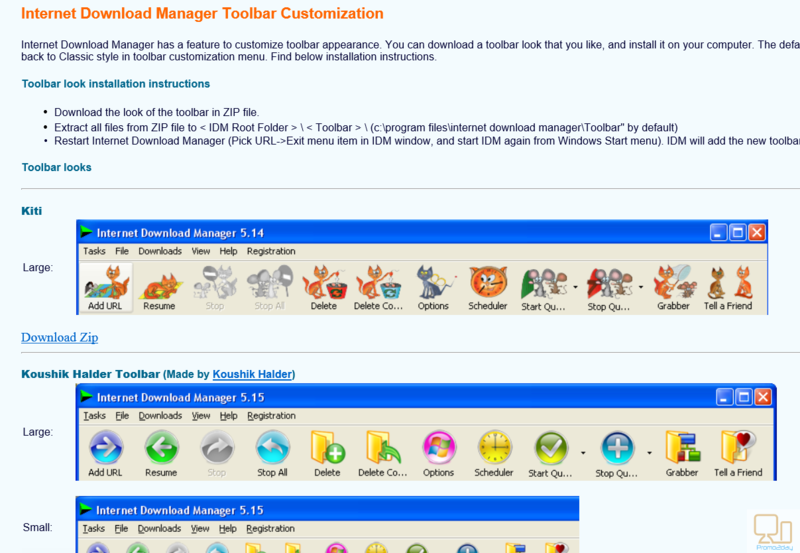 You can also access this page through the program option using “look for new toolbar option” located under toolbar menu. Simply download the skin file and save it to the program folder the restart the program. That’s all! 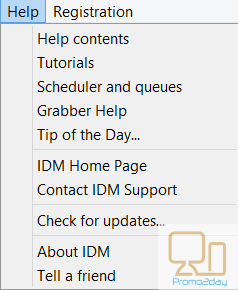 The new toolbar look will be available in the toolbar menu (located under view button) and you can select it at any time to enjoy a completely new IDM look. 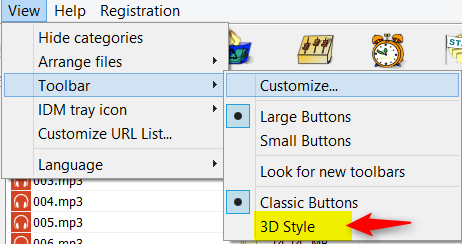 The toolbar option located under view menu helps you change the toolbar look so that you can use small buttons, large buttons, 3D or classic style. You can also use the customize toolbar option to add or remove buttons according to your use and preference. At the end you will enjoy a completely new look. Now, simply download your native language and save them to Languages folder located in IDM root folder. That’s all! 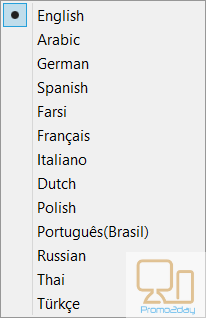 Languages supported include Albanian, Arabic, Azerbaijan, Bosnian, Bulgarian, Chinese, Croatian, Czech, Danish, Dutch, Farsi, French, German, Greek, Hebrew, Hungarian, Italian, Japanese, Korean, Lithuanian, Macedonian, Norwegian, Polish, Portuguese, Romanian, Russian, Serbian, Slovak, Slovenian, Spanish, Thai, Turkish, and Uzbek languages. 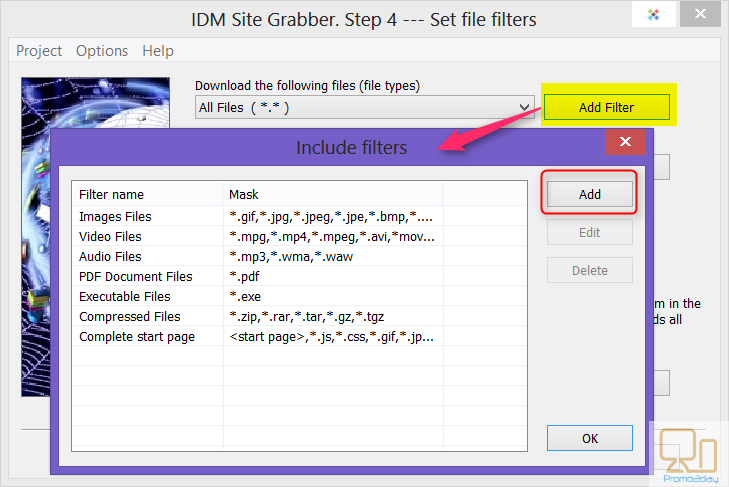 This menu includes the options to add new download, batch download, site grabber, import, export and exit. File menu shows options to start, resume, stop or remove download. 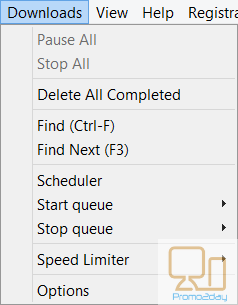 Downloads show scheduler, find, options, speed limiter, pause all or delete completed downloads. 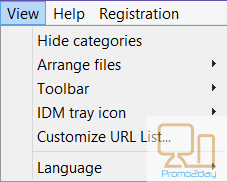 View include options to hide categories, arrange files, customize toolbars, tray icon and change language. What’s new in version 6.29 Build 2? What are the main Key Features that make IDM the best? 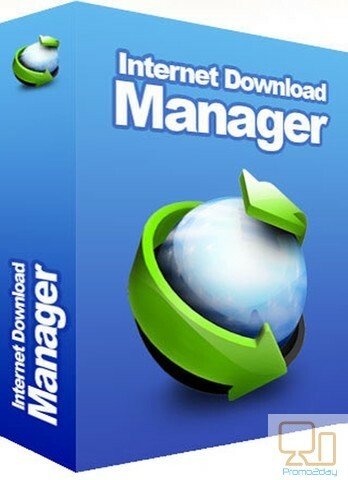 You can drag and drop links to IDM and drag and drop downloaded files out of Internet Download Manager. You can easily download multiple files at the same time using this built-in feature. 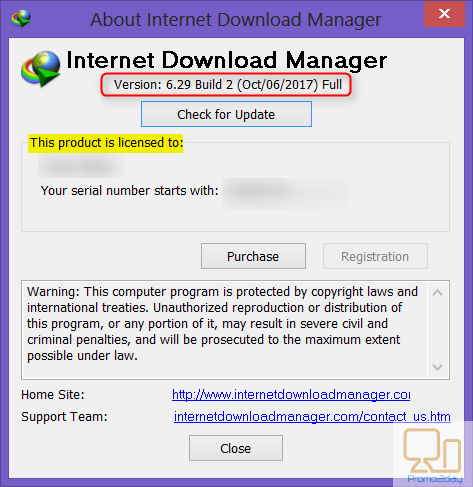 IDM can add all downloads linked to the current page. Resume unfinished download from the place where they left off. 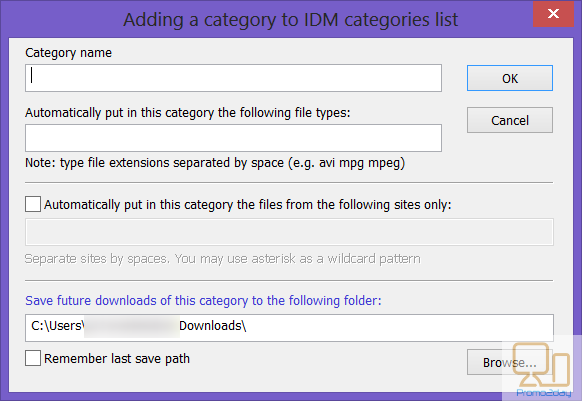 IDM has a built-in feature which automatically organize downloads automatically using defined download categories. This feature lets you connect to the Internet at a set time, download the files you want, disconnect, or shut down your computer when it’s done. Go to your work and the program will do everything for you. You can download any video on the internet with no need to pay for or use other apps. You will have all your favorite videos saved on your computer for offline playback. 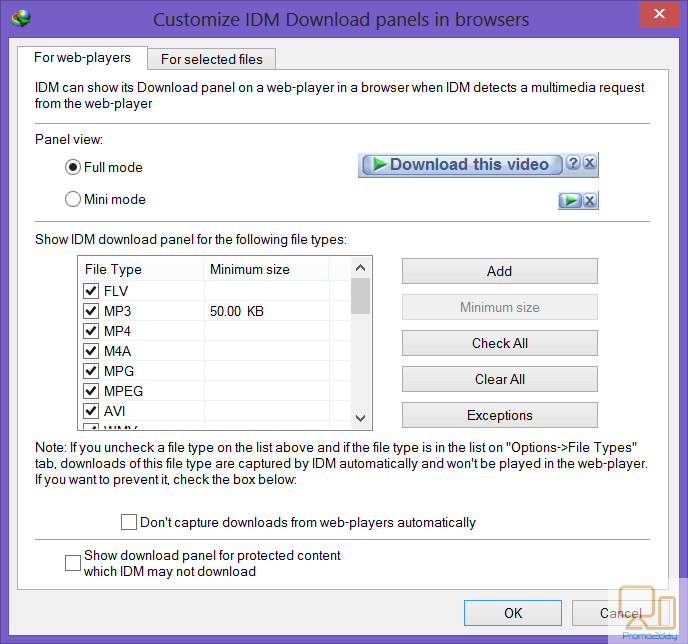 When you play any video you can easily see the IDM download panel which gives you all available formats for downloading the online video. 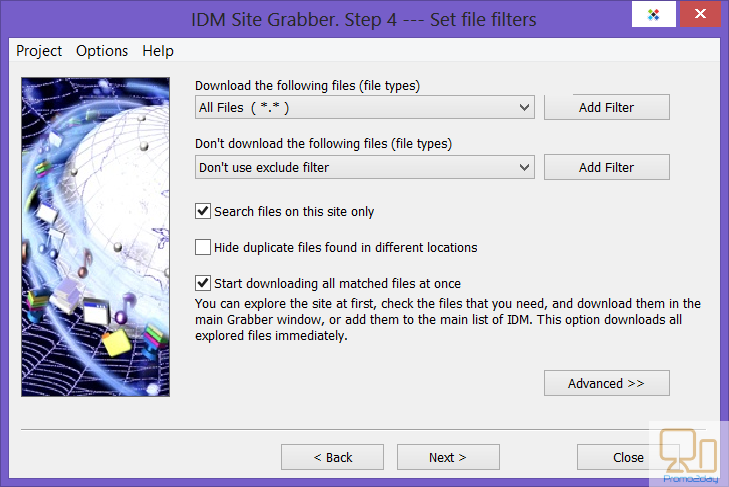 IDM downloads all required files that are specified with filters from web sites, for example all pictures from a web site, or subsets of web sites, or complete web sites for offline browsing. You can easily schedule multiple grabber projects to run and stop them at a specified times. In addition, you can run periodically to synchronize changes when available. You can complete installation in a few seconds with no need for any skills. IDM supports HTTP, FTP, HTTPS and MMS protocols. for example,Microsoft ISA, and FTP proxy servers. 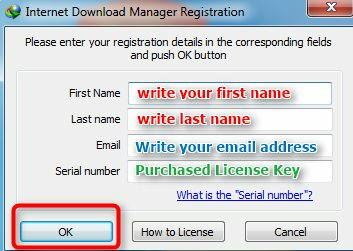 Basic, Negotiate, NTLM, and Kerberos: This lets IDM to access many Internet and proxy servers using login name and password. 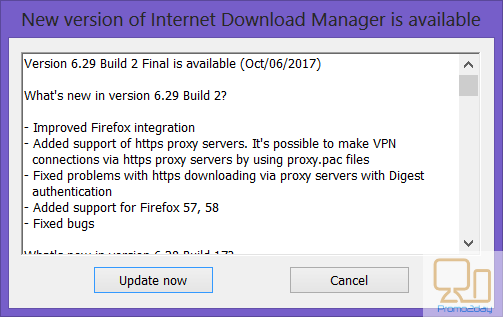 How update IDM and have the current version? 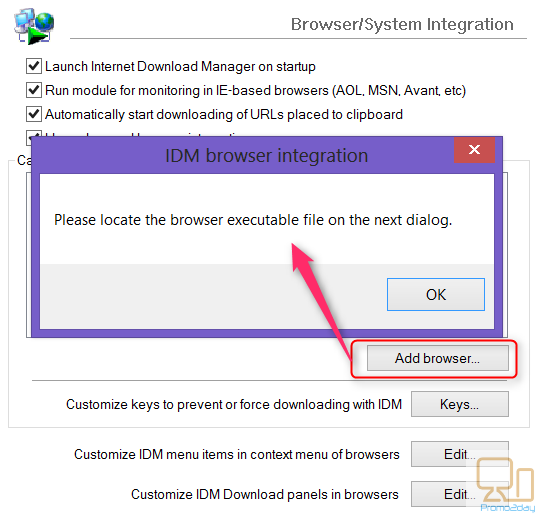 You can easily update IDM and enjoy using the current version. You can set the program to automatically check for updates every week or you can do this manually at any time using check for updates feature under help menu. 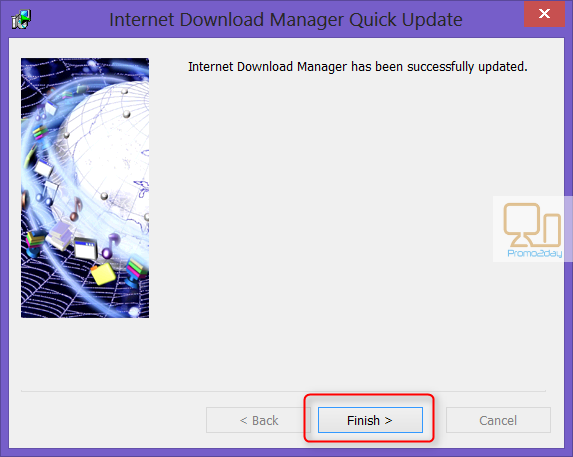 Quick update helps to easily check for new versions of the program once per week. All new features added to the latest version will be listed for you and you will have the option to update the program. Now, let me discuss the main features and functions of IDM in more details. We will see how to use the program and enjoy all its features. Of course, this is the main function of IDM and you need to know detailed information about it. 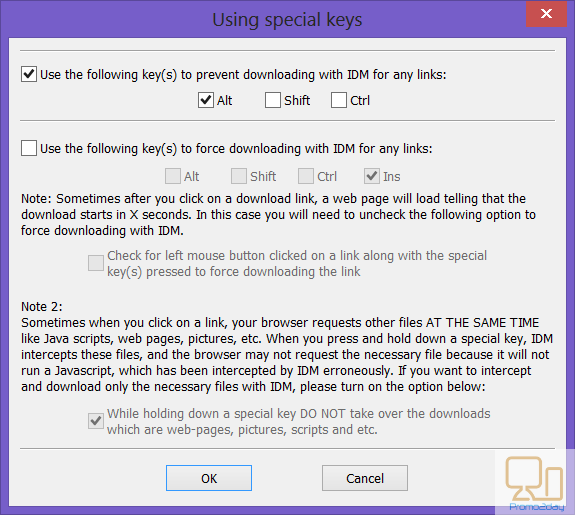 The program has many built in modes for starting and managing your downloads in an easy and quick way. 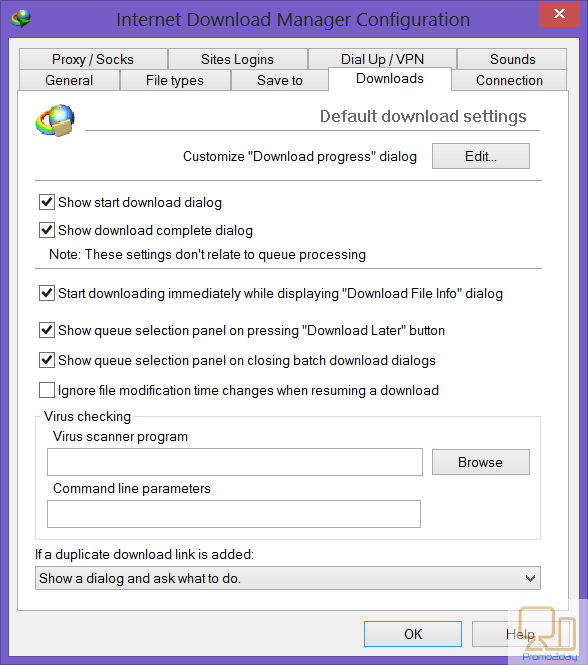 These built-in download modes include; automatic and manual download, batch download, download from web page or multimedia site, drag and drop, import download, clipboard download, command line download and site grabber. You will have any type of download in one application! 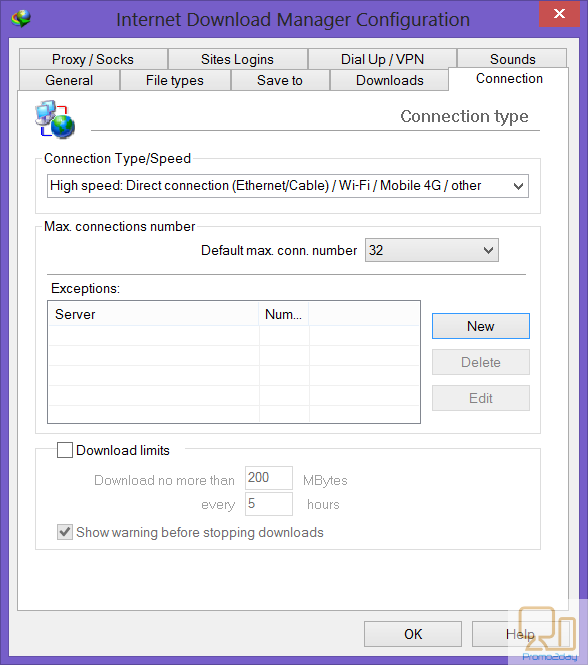 You can use the program at any time while surfing the internet. It is compatible with all known browsers with fully integration using plugins. The plugins are continuously updated so that you will enjoy good experience and smooth download. If your favorite browser is not listed, you can easily add it from settings using the general tab (will be discussed with the settings below). 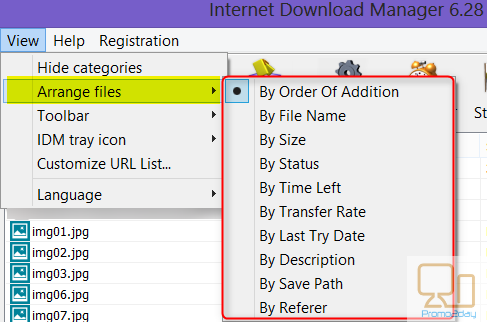 If you want to start the download process manually, you can easily do this using the right click menu or add URL. You will download your file at the highest speed. 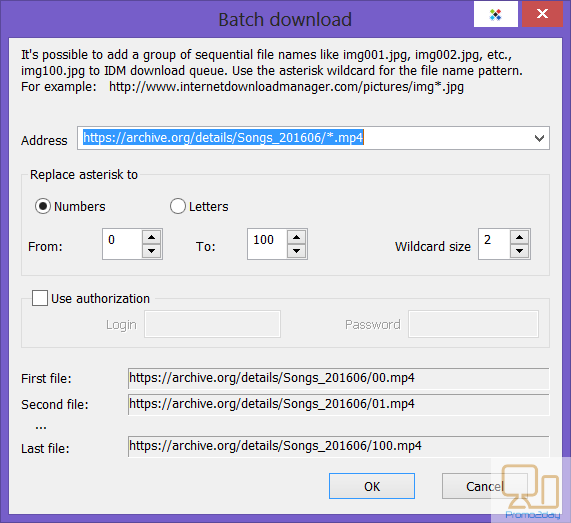 You need to specify the method you want to use to arrange your files either using numbers (for example from 1 to 100) or letters (from a to z) then select number of files and wildcard size, finally click OK. The program will detect the files arranged in a list with names, file size and download URL. Simply, select the files you wish to download and click OK. 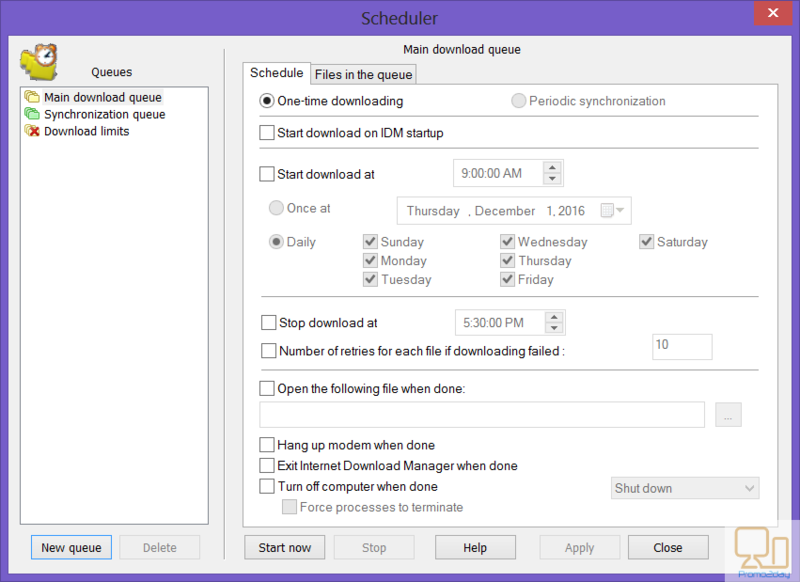 The files will be automatically added to the program scheduler. 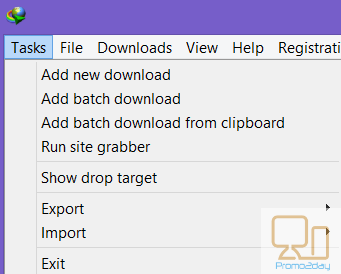 To make the process more and more easy for you, you can download your favorite files using simple drag of the link from your browser and drop it to the main window of the program, or to the drop target. This is available under task menu “show drop target”. After you complete your process close the drop target. Some advanced users find it easier to set command line parameters which will be used by IDM for starting the download process. You need to specify the local file name, path and download directory. This feature lets you save your download list. For example, if you are moving to a new computer or laptop, you can use this tool to restore all your download. The process is very easy. Simply, use import or export located under the task menu. You can export all your downloaded files in your list. It will be saved on your computer with the extension .ief or ef2. Import function allows you to restore and download these files later. The program will automatically detect the exported files saved by the user and restore it. 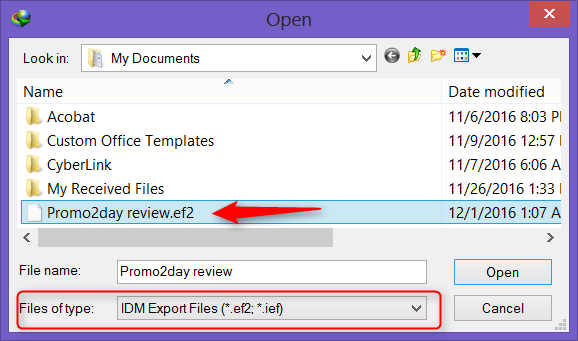 You can also import and export any downloads in the form of a text file. If you need to find a specific file, you will need a lot of time searching hundreds of files downloaded. IDM supports search function. This is located under download menu in the form of find and find next. This will save your time and lets you easily find any downloaded file. 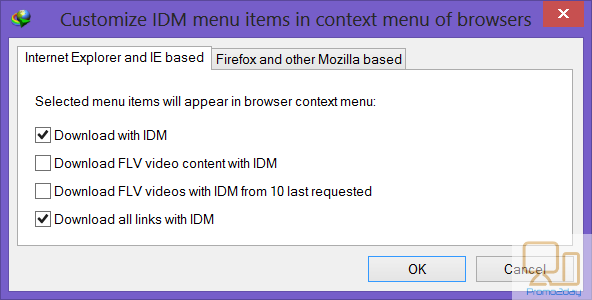 IDM allows you to download complete websites for offline browsing, for example, pictures or audio files . This is done through the predefined set of templates which make it easy to set the required project. 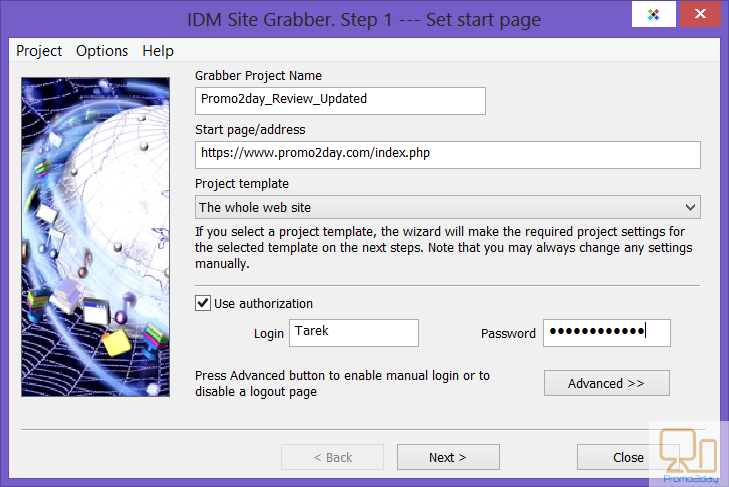 The site grabber can be launched from the download toolbar then you need to follow simple four step wizard that determines the website to be downloaded, the files to be downloaded, name of your new project and location to save it. After creating a project, the grabber starts to explore files and do everything for you. 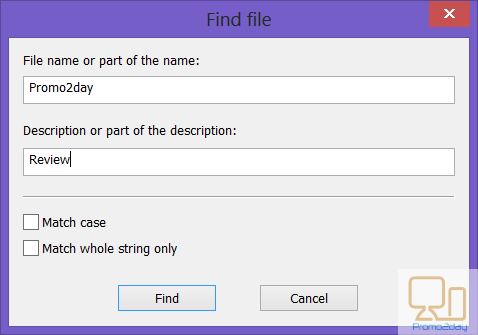 This step lets you set filters regarding the file types you want to include or exclude. Also it helps you to hide duplicates when found during download process. Finally, the website will be explored using the set filters till complete. 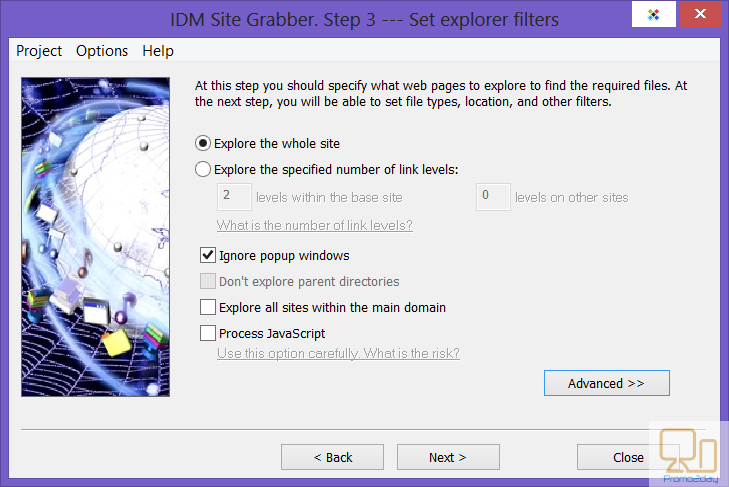 The progress of site grabber can be easily followed with available statistics. The process may need long time according to the website and filters. You will have a list of the files found. You can sort or rearrange files by type, size, name to easily check them. Now, select the files you will save and start download. This feature is very important as it will automate all your downloads. No more need to lose time or do effort for downloading all your files. The scheduler will automatically do everything for you. Two types of scheduler are built-in, namely the main and synchronization. The synchronization queue differs from the main download one in that it lets IDM to check for any changes available on the server so that the old files will be replaced with new ones. 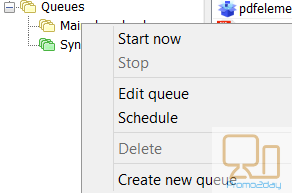 You can easily create a new queue using the new button on the scheduler dialogue or more easily right click menu of the queue options in the category tree. 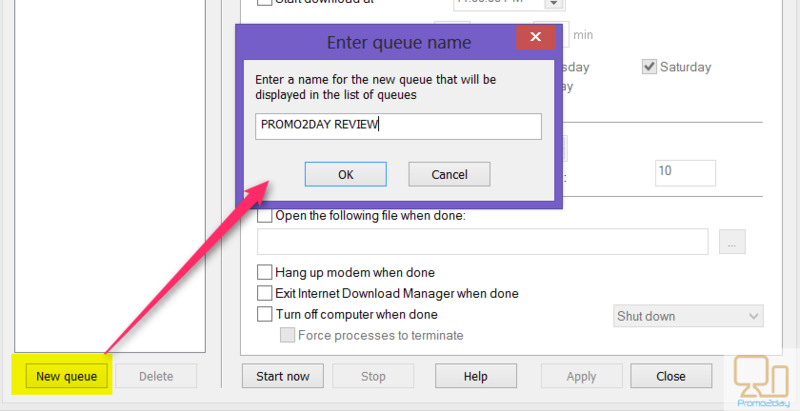 You will find many additional options such as start, stop, edit, delete or create new queue. The use of this tool is very easy. 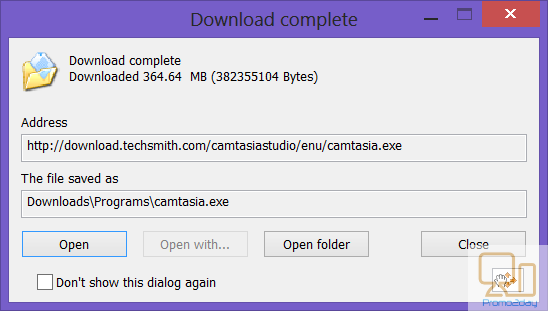 First, you need to add files to the queue (schedule) using download later on the file download dialogue. 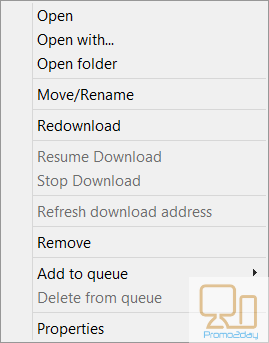 Alternatively, you can use of right context menu in the file download list in the main program area or drag and drop any download links by from the main list to the queue you want. Next step, launch the tool using the toolbar button or the download menu option. The program has many settings with many options available for users to set and change. This makes the program one of the most customizable. Settings are categorized under many tabs in a well arranged design. 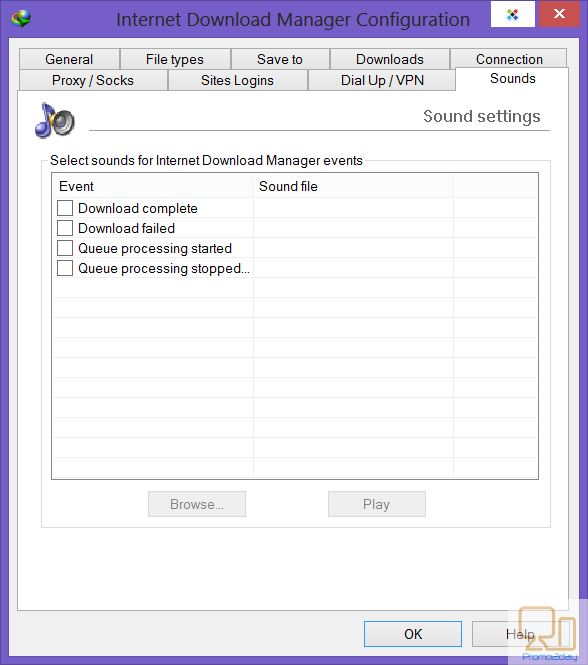 These include; general, file types, save to, downloads, connection, proxy, site logins, VPN and sounds. You can access the settings under download menu. If your browser is not listed, no problem you can add it easily. All you have to do is to open the settings general tab, and use add browser exe file. That’s all! Users can specify file categories and save locations through the options available here. You can add a new category if you wish. In addition, you can specify the default directory to save downloaded files and temporary directory to save file parts during download process. 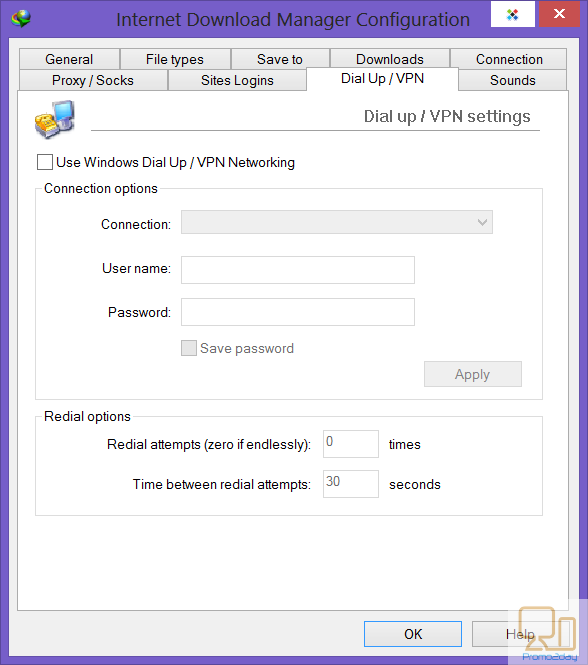 Using this option, you can simply configure your dial up and VPN settings so that IDM will be working with no problems. You can add sound when the download is completed or failed, queue processing started or stopped. the only supported music files type are of the “Wav” extension. Help our forum out by making a small donation.